Introduction: Laparoscopic liver resection has been widening the indications, even for the cancer treatment options. But laparoscopic liver resection has various concerning on the procedure per se and oncologic points or view. In the first place, gas embolism and appropriate bleeding control were the technical problems. Secondly, port site implantations and tumor cell seeding under CO2 pneumoperitoneum were worried among the surgeons. Recently, however, accumulating data revealed above expected problems were continually overcome, and, on the contrary, advantages over open conventional surgery of postoperative shortened recovery, immunological benefits, and small amounts of ascites were developed lowering incision. This study was conducted on hepatocellular carcinoma patients who were operated laparoscopically in Hwsun Chonnam National University Hospital, Korea. Methods: From July 2005 to August 2009, 46 patients were operated laparoscopically on the liver lesions. A Retrospective analysis was performed on the clinical outcomes of 22 cases of hepatocellular carcinoma patients. Results: Median operating time was 169 minutes. Median tumor size and surgical margin were 3.2 x 2.6 cm and 1.1 mm respectively. Median postoperative hospital stay was 9.8 (6-16) days. Transfusion was required for 3 patients. On the operation type, 2 right hemihepatectomies, 5 left lateral sectionectomies, 1 subsegmentectomies, and 14 wedge resections were performed. On the short-term followup period, 6 cases of recurrences were occurred. But no port site recurrence and peritoneal seedings were found. No postoperative mortality was reported. No postoperative complications above Grade III according to Clavien classification were found. 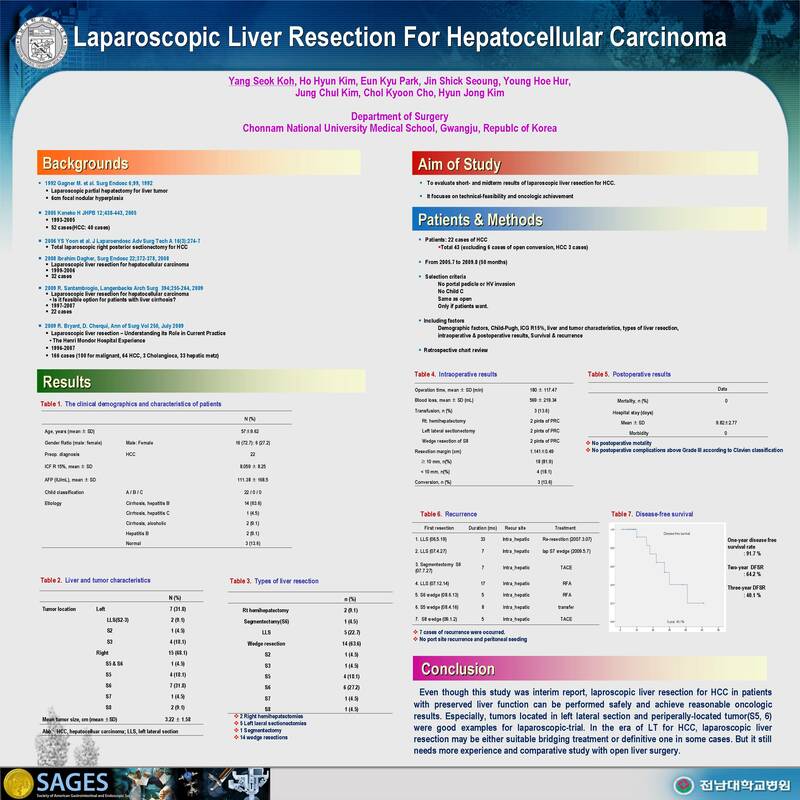 Conclusion: Laparoscopic liver resection can be performed safely for hepatocellular carcinoma. For certain location of liver, laparoscopic approach can be applied on routine basis.